AI Go vs World Champion match 1 | Uniting seven federations of the traditional mind sports : Chess, Bridge, Draughts, Go and Xiangqi with over 500 National Associations and close to one billion players. AIGo software took game 1 in match with world champion! 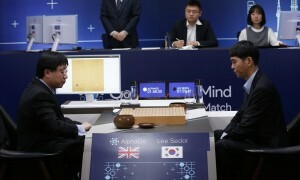 Alphago took the first game of the historic match between Google DeepMind’s artificial intelligence and the world’s top Go player, Lee Sedol. “#AlphaGoWINS!”, tweeted DeepMind’s CEO Demis Hassabis. Go has always been considered the last frontier of human intelligence against AI, but a match between AlphaGo and the European champion last October, won by AlphaGo 5-0, cast this status in doubt. In the current match, Google offered a million-dollar prize to the winner in order to entice the world champion to play the AI software. Up until just before the match started, the confident Lee Sedol was predicting a sweep. No one expected that, with an extra five months of self-learning, AlphaGo improved so much that it played a nearly flawless game and smoothly forced Lee to resign after 186 moves. Round two will be held after a day of rest.